The Lady of the lake from the Arthurian legend has always fascinated me, and the moment I laid eyes on a photograph sent to me of my niece Tessa, I knew I had found my inspiration for the painting of Nimue. It was a photo of Tessa, dripping wet from being caught out in a rainstorm. What caught my attention was the look in her eyes. 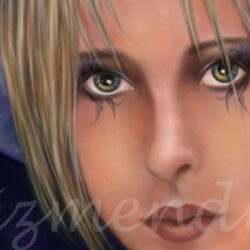 I loved it and began the painting of Nimue that very day. While most interpretations of Nimue’s role in the stories of Camelot present her in a negative light, I much prefer the more positive take on her role as a gifted student of Merlin’s and a Priestess of Avalon.